I hardly do reviews for blushes, the reason being that I hadn’t actually gotten into the habit of using them until quite recently. However, I had been eyeing this blush for some time. It is kind of like the blush counterpart to its more famous contour twin, and is definitely one of too cool for school’s star products. Flush, blush, baby! Put your best cheek forward with Too Cool For School’s By Rodin Blusher, a 3-in-1 blushing powder that leaves a naturally flushed hue on the skin. Made with fine pigments, this powder adheres well to the skin and shows up pristine even after a few layers. This product also helps to control sebum and oil production, so your blush will stay on all day. We love dusting this on the apples of the cheeks for a fresh-out-of-the-gym look! It’s a mouthful, but you can see that most ingredients are added for the colour pigmentation. The main ingredient used in this product is talc, which is great for your skin. Packaging: The packaging is not super cutesy, but I still like how unique this looks. It feels a lot more like an art tool rather than a makeup product – absolutely in line with the idea of ‘art class’. However, I do find this a bit bulkier than my other blushes, and not the most convenient product to carry around for touchups because there’s no brush attached with this. Colour: As you can see from the photos, there are three shades in one blush. 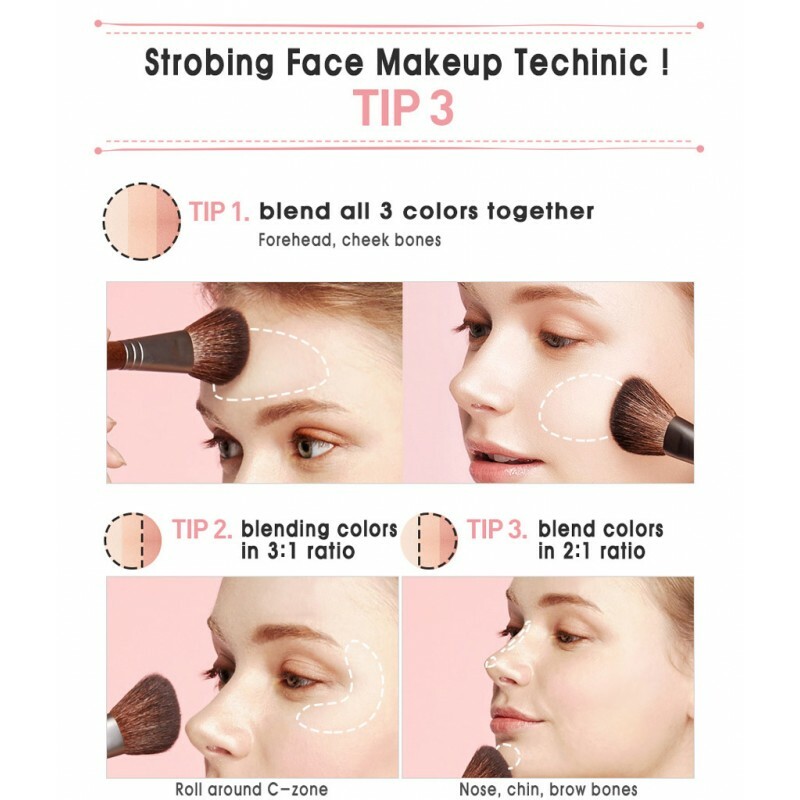 Thankfully, it doesn’t apply as 3 separate colours on the skin, but blends nicely (with a good brush) to form a gradient so that it looks more like a natural flush, rather than a blotchy spot of pink. Colour payoff & intensity: It applies as a very natural blush that doesn’t look too intense, and I personally really like how it takes just 1 or 2 swipes of my makeup brush to achieve this. I think this will be great for most skin tones, but may not show up as nicely if you have darker skin because the pigmentation of this blush is not very strong. Staying power: A dab of mineral powder is all it takes for your cheeks to stay flushed throughout the day. I can attest to having my cheeks look the same even after I had some of my blush accidentally wiped off during a brow styling session, even after I’ve sweated buckets in the hot sun, and even after a long day out. There are some K-beauty products that I’m pretty certain are overhyped (who knows why tbh), but this is definitely not one of them. If you are looking for a blush that gives your cheeks a natural gradient flush that can stay on all day, this is it. I’ve had no issues so far with regards to clogged pores or rashes, so this is pretty good for all skin types. SGD 20 is quite a fair bit of money to spend on a blush, but I think that this is a good investment that can last you for a really long time before you hit pan. I’m pretty excited to try out its contour counterpart in future, do let me know if you have tried it out and loved/hated it! I’ve tried it! And hit pan on their contour. It’s versatile but I decided not to get it again due to the price and colour payoff. I got the nature republic’s darkest ‘blusher’ instead which I’ve heard people use as a contour as well. It’s been working well for me, colour payoff felt better than the TCFS’s. I agree that the price isn’t the most affordable D: will definitely check out nature public’s blusher! Ouu, it’s so pretty! I think I want it, hahah. I have only tried the TCFS bronzer and I recently purchased the luminzer trio to try out. I’ve seen this product online for many years and always been very curious about buying it, I might just do that now because of your great photos which shows the colours perfectly. Thank you for a great review!